bounav – mods, tablatures and more. Last month I rented a car from goldcar.es in Sevilla, Spain. The car was great and the rental experience was good… Until yesterday when I received an email from gold card saying I received a parking ticket during the rental period. Goldcar forwarded on to the relevant local authority my details, which is fine by me and charged us a 40 euros admin fee. 1. The admin fee they charge your is based on the cost of the fine you get (goldcar have been nice and only charged me based on the late payment penalty and not the actual fine). 2. They don’t pay the fine for you and by the time you actually get it, you will be charged late payment penalties at least a few times. 1. I got fined 80 euros for parking the car in the wrong place in Jeres. 2. I only noticed the fine once hundreds of km away from the town, so I didn’t come back to sort it out because I thought goldcar would pay the fine on my behalf and back charge my credit card + a then justified admin fee, like most rental car companies do. 3. A month later, the local authority sends bill to Goldcar of 80 euros + 40 euros (50% of the fine) for late payment because the ticket wasn’t settled within 20 days. 4. Goldcard charges me 40 euros of admin fees. The ticket is still outstanding payment. Now I’m waiting to receive the fine through the post, which probably include another + 50% late payment penalty. Great service (not!) from goldcar. I wouldn’t min paying their admin fee if they were actually providing a service and were settling the fine on your behalf like other car rental companies do. 1. I genuinely looked around when I parked the car and didn’t see any indication that I couldn’t park on this parking space or that I need to put money in a park meter. 2. There are some instructions in English on the back of the parking ticket but they are so badly translated they do not make any sense. 3. On the ticket, there is no phone number to call or payment instructions or details of who to contact to settle the fine. 4. They don’t state that there is a +50% penalty fee if the fine is not settled within 20 days. 5. On the invoice they sent to goldcar, that goldcar forwarded me there is not contact details or instructions on how to pay the fine other than a dead link payment platform. Great. 1. The link to the payment platform worked today. It redirects you to a website secured with an unsigned SSL certificate. Great! For information this is the link: https://sprygt-sanciones.org/PagoTarjeta/. By the time you make it to the payment page the certificates are verified. 2. To pay the fine online you have to enter a 51 digit long number! Seriously? Total cost for parking in Jerez: 160 euros. Ouch. The results can be catastrophic when you’re grouping stuff by day and you’re instancing date with just the day component coming as a JSON serialised value like '2013-06-01T00:00'. If you want your dates to behave, always use the constructor that creates dates from int values (e.g. new Date(2013, 5, 1)). And remember: the month parameter is zero based (0 represents January)! I discovered this gotcha whilst developing a calendar visualisation for watchdogapp.com (using D3.js). You can see on the two visualisations above that in Chrome, parsing a date from a string does something extra (probably to do with summer time offset)! I’ve always loved VU meters (favouring the LED types over the needle ones). When it comes to mixing (live performances or recording project) they prove to be a must have metering tool in my opinion. Having dedicated hardware VU meter shows you your audio levels, even when you’re focusing on something else on your computer display. It also allows you to monitor any source of audio, even when your computer is off. For example, I find it quite really interesting to compare the level at which different albums are mastered to. If you don’t know what Volume Unit represents, I would suggest reading this article on sound on sound as well as this article about audio levelling on wikipedia. Of course you could buy an off the shelf VU meter, but why would you when you can build your own? JLM audio sells a variety of audio products, including DIY kits that are definitely worth having a look at. One of their kit is a 40 LED PPM/VU/GR Meter kit that can be stacked with another one to make it a stereo meter (I imagine you can stack more that two kits to build a multi-channel VU meter!). 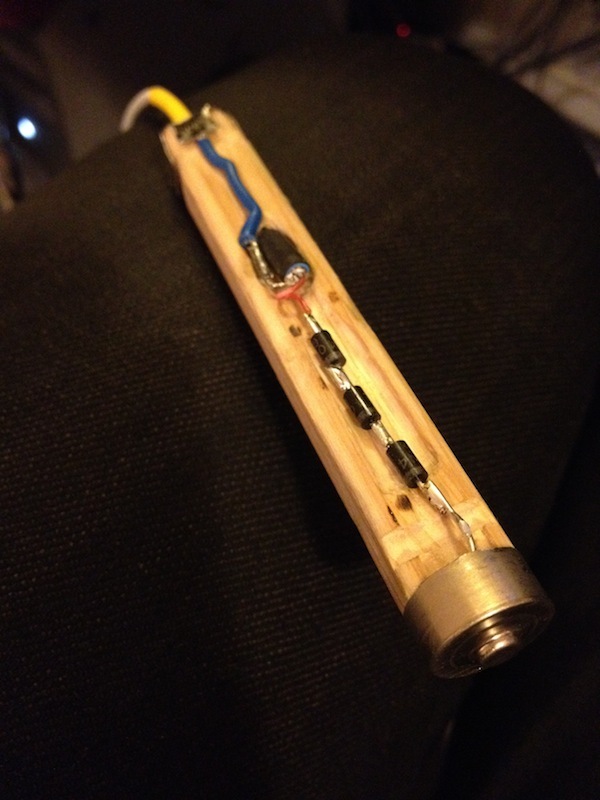 The first LED kit has the +5V to +/- 12V SPMS option and powers the second kit. The two boards are then stacked together using the provided spacers and female IDC 10 way connector. The USB connector lets you power the device using USB (from a computer or a mobile phone charger). The two XLR + Jack TRS combo sockets lets you connect any XLR or jack source. Using cinch to jack adapters you can even connect the VU meter to consumer audio products (CD player, hifi amp, etc). The slim line rocker switch is the power on/off switch and finally, the ON-OFF-(ON) switch lets your select the peak mode for the meter (jumper 7 on the 10 way connector). Always ON position: peak hold with decay drop back. The maximum peak is hold for a few seconds before it starts decaying. OFF position: peak hold. The maximum peak of your signal is hold and never forgotten. Momentary ON position: peak reset. Lets you reset the peak when in peak hold mode. When you receive your kit, you’ll receive all the components you need to assemble the boards, but you won’t find a user manual in the box (except solder and a soldering iron). 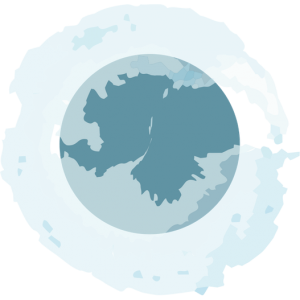 It’s OK: all you need to know is available on the JLM Audio’s forum threads. There a forum thread for the current version of the kit which contains all you need to know to assemble one board. To assemble two boards, also have a look at page two of the build thread for version 1&2 of the kit. There is a close up on how to solder the female IDC connector at the back of your master board so that you can stack two boards together! Very clever design! The diagram below summarises how I wired the two boards into the Hammond 1598BBK case. Depending on how you install the stacked board in the hammond case you might have to install the jumper 4 (on the master board’s 10 way IDC connector) to reverse the direction of the metering on the LED bars. Calibration is easy given you have a signal generator (also called function generator), hardware or software like the Test Oscilator plugin that comes with Logic. In logic, start an empty project with one audio track. On your track, insert a Test Oscilator plugin. All the tracks should already be set to 0dB, in the plugin make sure it outputs a 1kHz sine signal at 0dB. If you have a function generator, use the 600 ohms output and generate a 1kHz sine at 1.228 VRMS (this is the 0VU or +4dBm reference level). Connect your JLM audio VU meter to your sound interface or function generator. Peak calibration: turn up RV1 (input trim) until the 40’s LED (red) just turns on. VU calibration: Then adjust RV2 (VU trim) until the 40’s LED (green) just turns on. Repeat the calibration process on the second channel and you can start using the 40 LED stereo VU/PPM. At work I have an core i3 iMac 21.5″ from Mid-2010. Unibody iMac computers are great machines but I cannot stand the glass panel: It looks great but it’s a nightmare to have a piece of highly reflective glass between your screen and yourself. I don’t really understand why apple did not offer the option to have the computer’s glass panel replaced with a black mat plastic bezel. I’m not talking about the LCD screen, but just the glass panel that can easily be removed with suction pads to get inside the computer. A couple of weeks later had a brainwave: I should be able to use diamond cutting discs and my dremel to cut out a window into the glass panel thus eliminating the annoying reflections. I did so and… it was a bit a disaster. Wear a breathing mask unless you want glass dust in your lungs. Wear protection glasses (I felt on several occasions small shards of glass hit my hands and face!). The good news is behind the black bezel of the iMac’s glass panel is a thin metal frame that sticks to the glass and holds it together even when the glass is broken. Once the window cut out of the panel I used a large sheet of black vinyl to cover the sharp edges of the panel and render it mat. Check out the end result bellow. I am really thrilled with the results: No more headaches and annoying reflections between the LCD screen and my eyes! There are still reflections from the glossy LCD screen but these are not a problem at all as the surface of the screen is treated just like macbook air screens’ are. Batteries on the Magic Trackpad last an amazingly long time. I would say about 6 months for my usage (on alkaline cells). 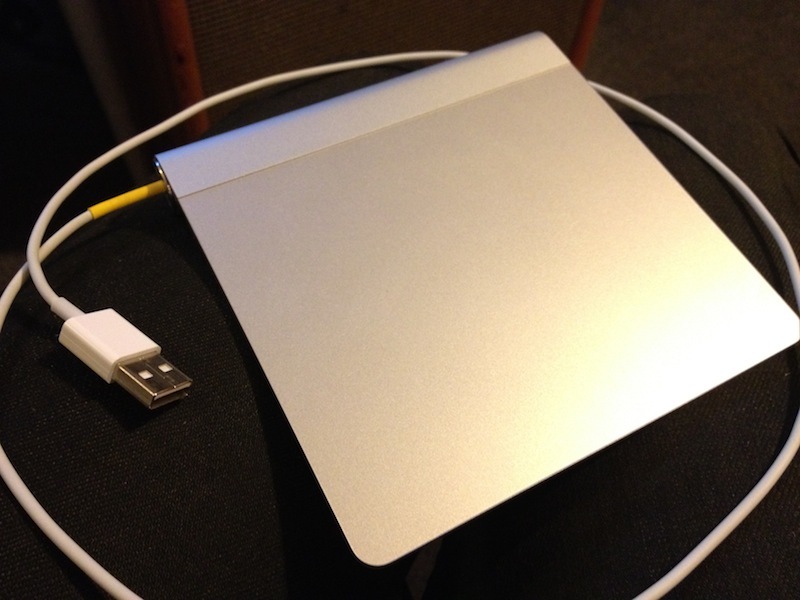 Nevertheless, eventually running out of batteries is always annoying so the other day I decided to power the Magic Trackpad using an USB cable. This mod has already been documented on macrumors.com’s forum. 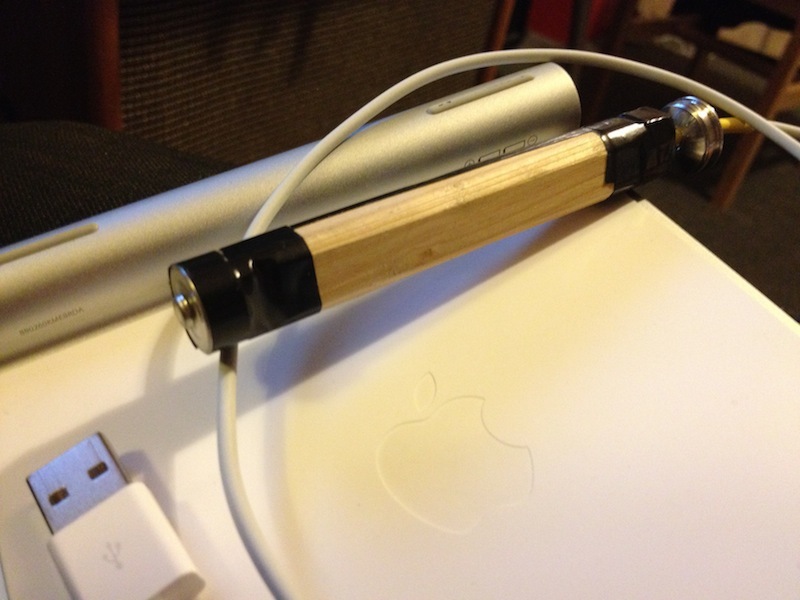 My twist on it was to drill a hole in the stainless steel battery compartment cover instead of leaving wires exposed or drilling through the trackpad’s body. 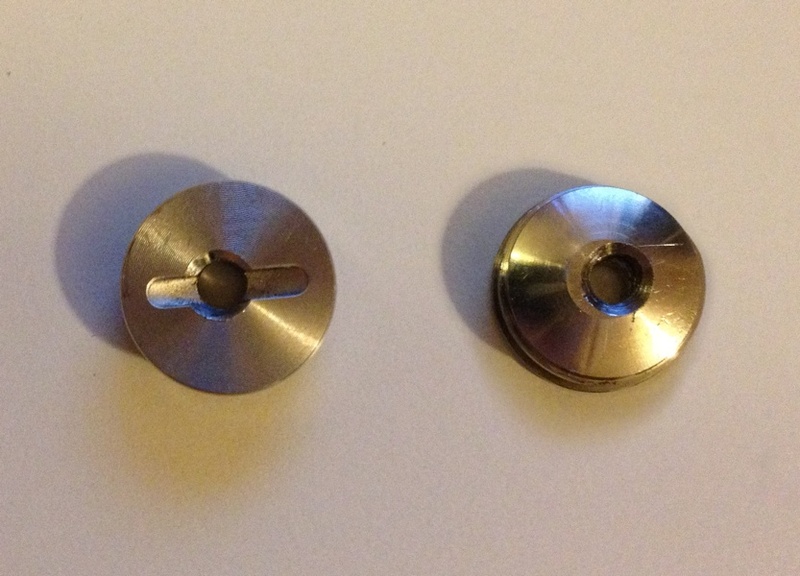 Be warned that drilling stainless steel requires a lot of patience. You also need a drill that can rotate a slow speed and Cobalt drill bits. It is really important to take your time and not to drill for too long otherwise the heat will turn the stainless steel into super hard steel you will not be able to drill through. In the case of that battery cover, being small it will get hot very quickly so I drilled for 30 seconds at a time, waiting a minute or two in between to allow for the piece to cool down. It took me a whole afternoon to drill through the cover! I used three 1N4001 diodes in series to step the voltage down a bit (from 5V to about 4.2V). You could use an extra two to bring the voltage closer to 3V, but the trackpad doesn’t seem to mind being powered by tensions over 3V (don’t try with more that 5V though) (I’m pretty sure Apple’s engineers used regulators to protect the trackpad’s internals). In the process, I discovered that the positive end of the battery ersatz have to reproduce the shape of the + side of an AA battery. If the + end is flat it will not work. There is clever mechanism that doesn’t close the electrical circuit to prevent from damaging the trackpad if you insert the AA batteries in the wrong orientation. Bellow are a few pictures of my mod. Enjoy! View this tab on google docs. 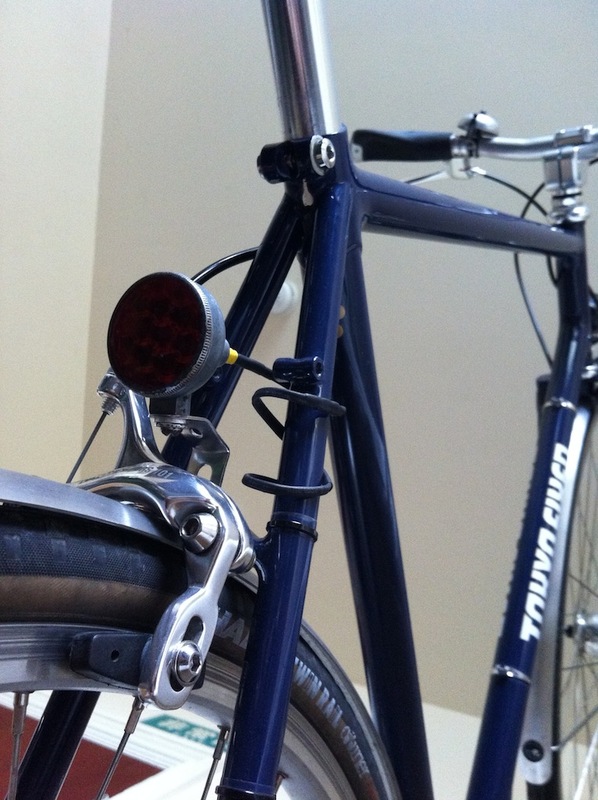 Recently, I found a gorgeous looking bicycle rear light on eBay. 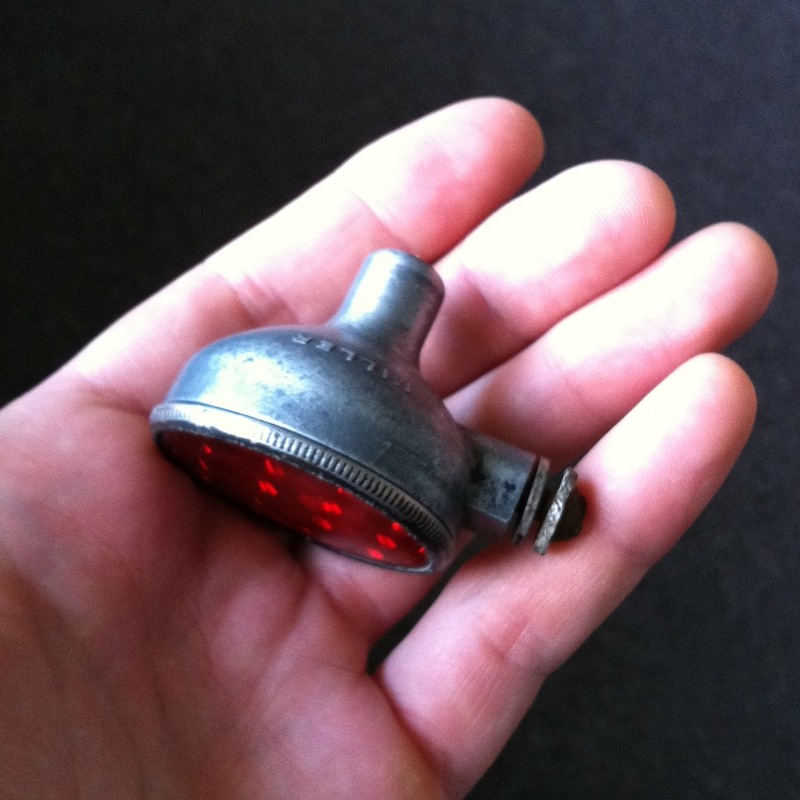 Unfortunately, I couldn’t find much about on Miller as a bicycle light manufacturer and the different models they used to make… If anyone knows about it feel free to leave a reply at the bottom of this post. 597 rear lights are bottle dynamo lights so there is only one piece of wire coming out of the back them, but I converted this one to work of my hub dynamo! 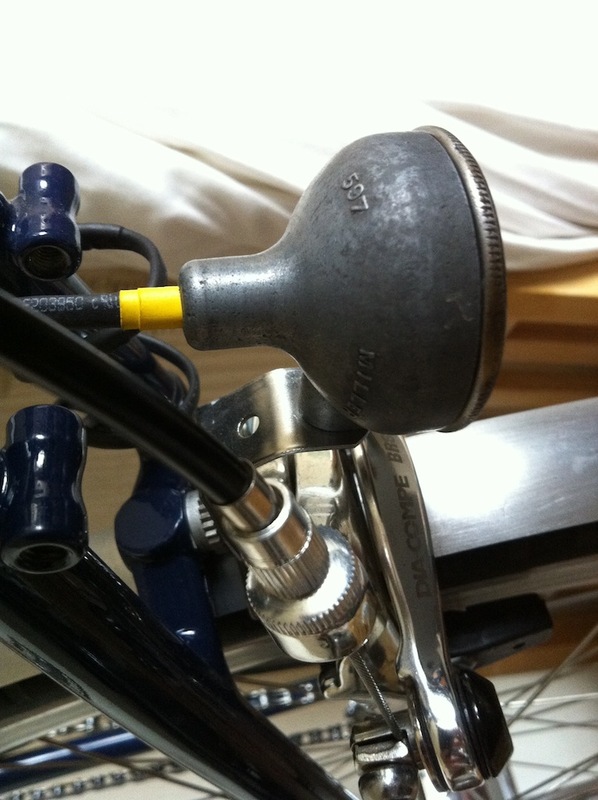 With a bottle dynamo fitted on your bike, the frame is the return path of the electrical circuit and you only need one piece of wire that runs form the dynamo to the lights to bring the current to the light bulbs. With dynamo hubs, the frame is not part of the electrical circuit and you need to lay a 2-core wire from the front hub to the lights (usually the front light has a switch that the front and the rear light on & off). It was quite easy to remove the original one core piece of wire to replace it with a 2-core one: I drilled into the rear of the light through the 1-core wire and also removed all the tar that was used to seal the unit and make the lightbulb holder stay in place. Next step was looking into how to replace the lightbulb with an LED. LEDs on a bike are advantageous over incandescent lightbulbs because they are absolutely immune to vibrations (there is no filament to break). Incidentally they consume a lot less current but that’s not something you worry much unless you power them out of batteries. Generators (dynamo) are AC generators. Their output tension is not regulated (the faster you cycle the more energy they produce) so I had to think about voltage and current regulation before using LEDs. Here is a diagram of the circuit I built and managed to fit inside the 597 (these lights are small!). The diode bridge that turn AC into DC. The 0.47F (yes half a Farad) memory backup capacitor that smoothes the DC tension. The design above has the advantage to give a “stand light” facility. That is to say, when you stop cycling (at a red light for instance), the 0.47F capacitor is charged an keeps powering the circuit. Depending on how much current is draw by your LED the light should stay on few minutes after you have stopped. It should cost you less than £10 to source the parts above. If you are based in London, the people at Cricklewood Electronics should have the components needed in stock! Bellow are two pictures of the modified Miller 597 installed on my road bike.